Curtis S. Fallgatter | Fallgatter Catlin & Varon, P.A. Curtis S. Fallgatter has practiced law for over 30 years. He was a federal prosecutor in Jacksonville, Florida for 17 years, and was the Chief Assistant, supervising some 20 lawyers, handling some of the biggest cases in the office. He contributes extensive trial expertise gained through numerous high-profile criminal cases, and leadership capabilities through past supervision of a large number of lawyers in criminal and civil cases in the U.S. Attorney's Office. For the past two decades, he has been in private practice, defending the rights of clients in criminal cases. 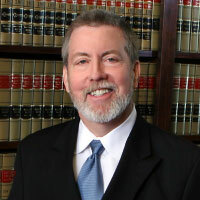 He has been recognized as one of the top criminal defense attorneys in the United States. Mr. Fallgatter has been relied on by local TV stations and the Dr. Phil Show, as a high-profile defense attorney, to provide commentary on criminal subjects ranging from DUI cases to complex white collar cases. Of note are some of his recent appearances on WJXT Channel 4's The Morning Show. AV®, AV Preeminent®, Martindale-Hubbell DistinguishedSM and Martindale-Hubbell NotableSM are Certification Marks used under license in accordance with the Martindale-Hubbell® certification procedures, standards and policies.